The natural world and new technology are coming together to help people explore Kielder Water & Forest Park and learn about wildlife and habitats. People visiting the Park can now get involved in a brand new geocaching project, taking them on a GPS-led treasure hunt around the area. 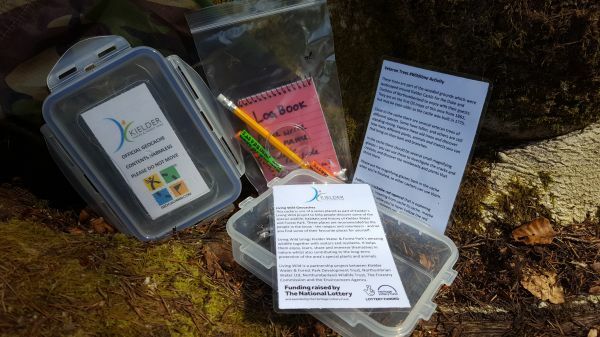 As part of the Heritage Lottery-funded ‘Living Wild at Kielder’ project, four new wildlife-themed geocaches have been placed around the Park’s ‘Wilder Walk’ route, which links some of the beautiful natural habitats and tranquil spaces between Kielder Castle and Bakethin Nature Reserve. Geocaching is a real-world, outdoor treasure hunting game, played using GPS-enabled devices. Participants navigate to a specific set of GPS co-ordinates and then attempt to find the geocache container hidden at the location. Once there, they can find out why that location is so special. All of the spots have been selected by members of the Forestry Commission and Environment Agency teams, who chose some of their favourite sites on special locations among the woodlands. Despite the poor phone reception in the area, people can still take part by turning on the ‘location’ function on their device, turning it into a GPS receiver. Two “trackable” creatures, a red squirrel and a salmon, have been placed in the geocaches, with instructions for players on how they can help them achieve their mission of moving around the Park and beyond. ‘Living Wild at Kielder’ is a project that will help people experience and learn about the area’s special animals and plants through the development of ‘nature hubs’ and a year-round events and activity programme. Lynn Turner, Director of the Kielder Water & Forest Park Development Trust, said: “Geocaching is something brand new for the Trust and a great way to integrate technology with the natural world and really get people of all ages excited about exploring. To find out more, sign up to geocaching.com and find caches and trackables placed by VisitKielder.